DRAGON symbol stands for energy, good luck, heroism, nobility, courage, vitality, and happinessIt signifies happiness, fertility, and immortality. In feng shui, a dragon symbolizes the opposing energies of yin (female) and yang (male), and together help to achieve a balance of power. Its creation involved only high vibration - each layer was infused with healing Reiki, and treated to 528Hz vibration, in positive state with Love and Light.. This Orgone device was created in order to help you in raising your vibration, bring inner peace and balance. It will help you in balancing and harmonizing chakras, while connecting mind, body and spirit as one, activating your Chi channels and clearing all the negative energy in your body and around you. It will bring love, awareness and luck into your life. It also will absorb electromagnetic pollution, transmuting the negative energy into positive one. 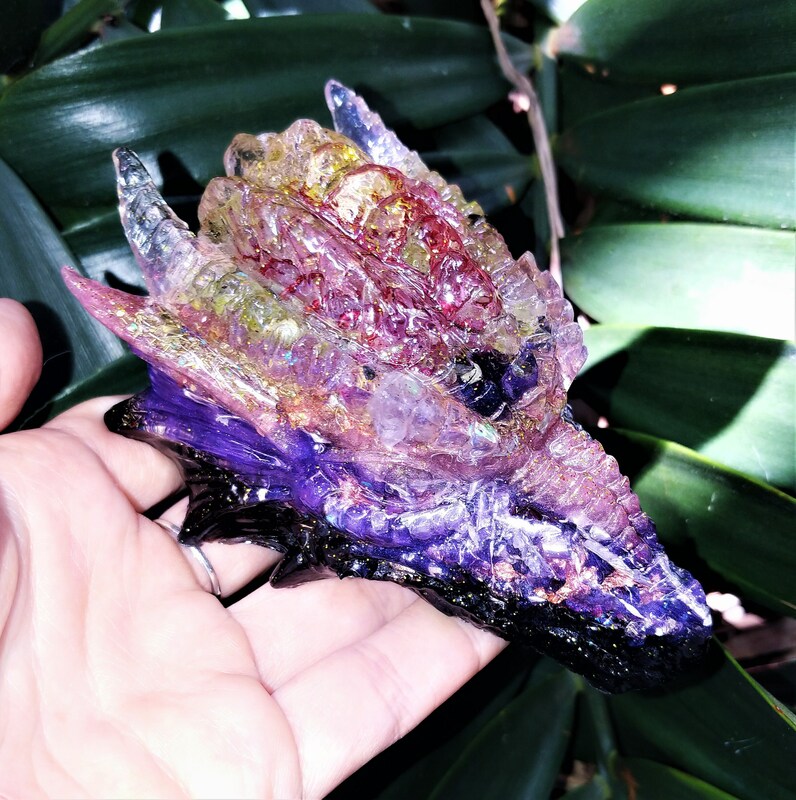 It contains 3 Purple Aura Quartz wrapped in copper wire, 4 Rainbowл Aura Quartz wrapped in copper for conductivity, Blue Apatite, Peridot, Larimar, Charoite, Carnelian, Amethyst, Rose Quartz, Citrine, Elite Shungite, Shungite Powder, Pyrite sand, Mica Flakes, 24 K gold flakes, Metal shavings, Copper leaf, Clear Quartz Crystal, Copper coil, Black Sun Iron Oxide nano powder, jewelry grade epoxy resin. This Orgone device is done in layers to assure the organic-inorganic layering for perfect performance (THE MORE LAYERS THE BETTER FOR CLEARING THE ENERGY). Crystals are cleared in ocean water and charged with sun light. While each layer was curing it was treated to the 528 Hz vibration of love and light..
Every orgone device needs to be charged in the sun light or moon light from time to time (to clear negative energy and to recharge it). Also it is beneficial to place it near Selenite crystals - they are known as cleansing stones. This energy will quicken your contact with the Goddess. By accessing the Divine Feminine you may soothe and heal your emotions and release stress. This is a highly spiritual stone that works effectively within all of the chakras from the heart chakra through to the crown chakra. It has a distinct vibration that aids you to communicate with clarity, and because of its heart based energy it helps you to speak of your emotions. It has powerful metaphysical properties that help to dissolve emotional barriers and to release stored negative emotions such as angry thoughts, remembered pain and other detrimental emotions that are not benefiting you. Carnelian is a stone of creativity, individuality and courage. Like all agates, it has protection energies. It can aid memory, including recall of past lives. It can assist one in finding the right mate. It is also a stone of protection in general and from anger, jealousy and fear. In addition it can help with manifestation of one's desires, and brings good luck. Carnelian can help ease or remove sorrows. It also helps stabilize energies in the home. It is sometimes called the "actor's stone". Carnelian is associated with the root and sacral chakras. It is strong stone to aid the physical body, as it maintains an improved flow of life force energy via the blood. The vibration of this bright orange stone, will accelerate your motivation, and aid you to clarify your goals, so you can find your best direction in life. This power stone stimulates ambition and drive, so it will aid you in manifesting what you require to move onto your desired path forward in life. It aids moving forward on a new life path, and will aid you to make new, clearer decisions and better future career choices. Called The Merchant's Stone for its properties of increase in the cashbox, Citrine not only assists in acquiring wealth, but helps in maintaining it. It is a stone of abundance and manifestation, attracting wealth and prosperity, success and all things good. It also encourages generosity and sharing good fortune. Citrine opens the higher mind to accept joy in one's life, releasing anger and negative feelings, deep-seated fears and destructive tendencies. An excellent crystal for overcoming depression, Citrine reduces the sensitivity to criticism and inspires creativity and self-expression. It raises self-esteem, and by letting go of the past, allows one to move forward optimistically, enjoying new experiences and explorations. Citrine is a powerful purifier of one's will center, helping to identify and heal issues of power abuse and feelings of helplessness. It enables one to understand what is necessary to resolve those situations, and provides the courage and fortitude needed to make difficult decisions and take action. Traditional symbol of love, rose petals also known as a symbol of inclusion, universal understanding and order. In mythology, rose meaning is associated with Aphrodite (Greek) goddess of love. Orgone accumulating device is a substance which functions as a self-driven, continuously-operating, highly efficient energy transmutation device, drawing in negative life energy and transmuting it into positive energy. It is reputedly protects one from harmful EMF radiation. Some people feel increased energy and a greater sense of well being when wearing or being in the vicinity of orgone energy. Orgone products are made with metal shavings and epoxy resin. Quartz and copper are popular ingredients due to their conductive properties. The resin is poured over the quartz and metal shavings, and it shrinks as it hardens, exerting pressure on the quartz, permanently squeezing the quartz crystal inside which creates a well-known piezoelectric effect inside the crystal, meaning its end-points become polarized electrically, this apparently causes it to function more effectively as a positive energy generator. Sensitive individuals will feel the heat and light tingling radiating from the Orgone products. Some people may experience increase of energy levels.